Super Hexagon is a recently released iOS game that challenges your mind and reflexes in a simple and terribly frustrating way. The game is amazingly clever in it's simplicity, and every game designer should use it as a reference for some of the finer points of game design. Please excuse my images, as it's hard to hit the screen capture buttons without promptly losing! Ok, that's a lie. 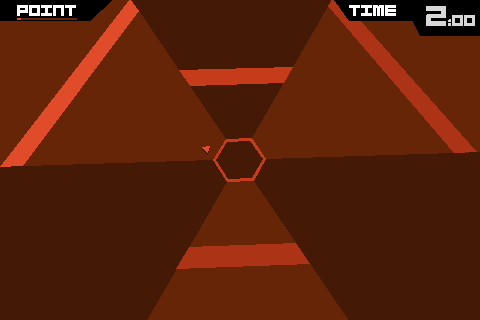 Super Hexagon is exceedingly hard (more on that later), but to understand the game is simple. 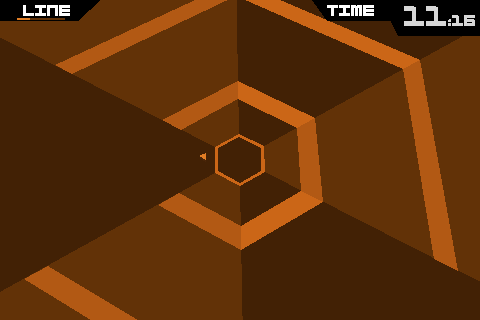 A player touches the right or left hand side of the screen to move the cursor around a hexagon. That's it. The cursor (which is a friendly little triangle) is on a fixed path that moves smoothly around the center hexagon - hold the right side, it moves clockwise; hold the left side, it moves counterclockwise. Anyone can pick it up and master the controls in minutes. The game also involves a simple goal - avoid the lighter colored regions. Simple, right? 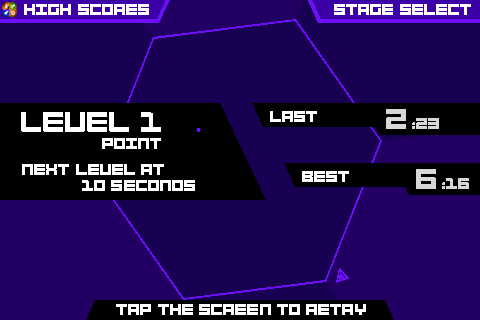 Super Hexagon is absurdly difficult. The first level of difficulty is called hard- that should be your first clue. The game doesn't hand hold at all, if you're going to play, you're going to lose. The first round, you may last 3 seconds. The next, 5. At some point, you may hit 30 seconds in the easiest difficulty. We call that an early Nintendo kind of difficulty. And that's a huge reason why the game is fun. 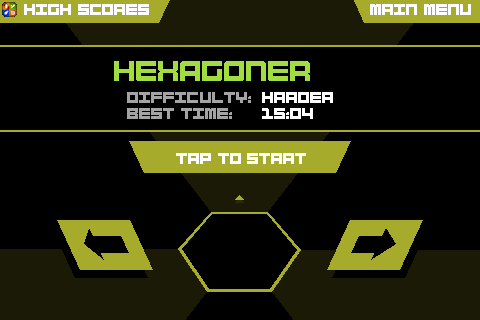 Super Hexagon has very precise controls. The key to a game of fast reflexes (such as Super Meat Boy) is perfect controls. You can move smoothly and change directions when you want to - the fault of losing is your own, not because the controls are touchy. So many games are broken because of poor controls - particularly ones that require quick reactions on a touch screen. The developers put a lot of thought into creating a control scheme that responded exactly to your will, and it shows! 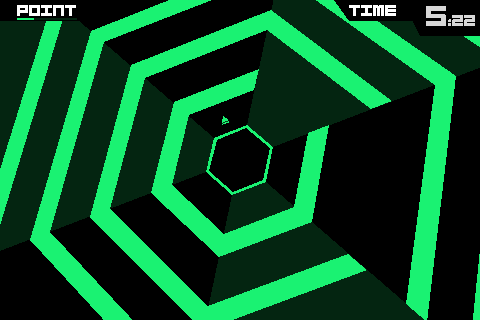 Super Hexagon has simple, beautiful graphics. Super Hexagon has amazing sound. The chip tune (is that what it's called?) sound track sets the perfect tone, the voice over cues are great and the few necessary sound effect are exquisitely integrated into the audible fabric of the interaction. The beat and voice overs give the player a little bit of an edge in conquering the difficult pathways and fill out the entire experience. Super Hexagon has excellent timing and patterns. You lose early and often, yet you can restart the game almost instantaneously. I hate games that put too many moments between the halt and reset. You can play again and again without getting too far removed because of Game Center announcements or other unnecessary disturbances. Beyond simply creating a smooth transition back into the game, the game itself is filled with amazing patterns that appear in a semi-random order. You can learn how the patterns move (I even name mine) and then anticipate them when playing multiple times. My favorite so far is the Barrel Roll, which I mastered after 30 or so play sessions. The patterns give the player a way to excel through repetition, while preserving a rich variety and the challenge of the unexpected. Just when you've mastered the Hexagon, (minor spoiler!) the play field transforms into a Pentagon! I won't ruin what's next, but you better believe it's more difficult! I really encourage everyone to try the game out. I cannot promise that you'll necessarily enjoy it, as many of my friends were way too frustrated to push themselves past 10 seconds. But there are a lot of elements to learn from, particularly if you are interested in any form of game design. Did I mention game design!? Did you realize that iD Tech has camps that allow you to learn all sorts of game design, from 2D to 3D to modding to iOS to Android? You should check that stuff out!